Upton’s Naturals, an independently owned natural foods company based in Chicago, have focused on creating meat alternatives with vegan values since 2006. They offer a range of plant-based protein goods including various flavours of jackfruit and seitan, as well as ready-made dishes such as Thai curry, macaroni cheese, noodle dishes, vegan bacon and a classic burger – all created with real, recognisable ingredients. 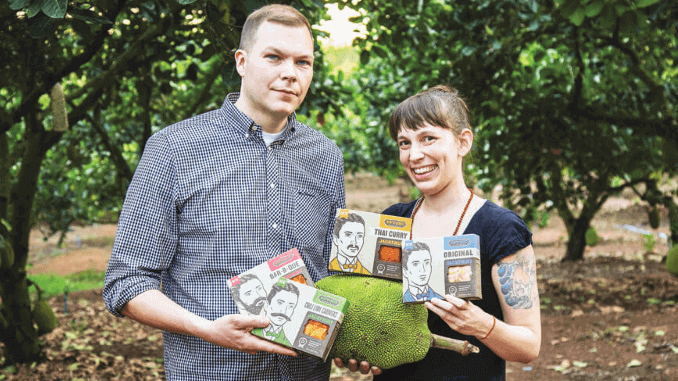 Upton’s Naturals’ founder, Daniel Staackmann, was a pioneer of flavoured seitan, and also launched the first-to-market seasoned and ready-to-eat jackfruit in the United States. He kindly took time out of his busy schedule to speak to vegconomist. 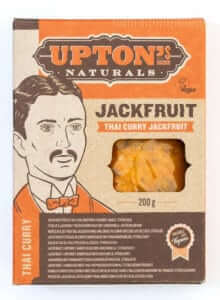 We offer Upton’s Naturals’ Jackfruit in Bar-B-Que, Chili Lime Carnitas, Thai Curry, Sriracha, Sweet & Smoky, and Original (unseasoned) flavours. 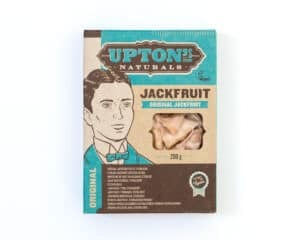 Upton’s Naturals kickstarted the jackfruit trend in North America and Europe by introducing the first pre-seasoned, heat-and-eat young Jackfruit to market. We also have Upton’s Naturals’ Meal Kits; Thai-inspired, vegan Meal Kits made with real, whole-food ingredients and feature pre-cooked noodles and fresh (never freeze-dried) vegetables, in Massaman Curry, Pad See Ew, Thai Spaghetti, and Thai Curry Noodle flavours. Upton’s Naturals’ Ch’eesy Macs are a cleaner, plant-based take on a classic comfort food, and finally, our popular Upton’s Naturals’ Seitan in Italian, Chick, Bacon, Chorizo, Ground, and Traditional flavours. Upton’s Naturals is dedicated to making minimally processed foods with simple, whole-food ingredients. Our pre-seasoned Jackfruit is a great example of this. The package contains Jackfruit and ingredients you might find in your house, such as spices and coconut milk. Similarly, our Thai-inspired Meal Kits are made with real, whole-food ingredients like fresh (never freeze-dried) vegetables and flavorful spices. Many of our products are also free of soy, oil, GMOs, and artificial or “natural” flavors. In Europe, Asia, and Canada, we’re introducing Sweet & Smoky and Chili Lime Carnitas Jackfruit flavours. These are in addition to the three flavors that are already available (Bar-B-Que, Thai Curry, and Original). We’re also launching two varieties of our Meal Kits (Massaman Curry and Pad See Ew) to these markets. In Australia, all six varieties of Jackfruit are currently available, and we’re launching our Meal Kits and Ch’eesy Mac lineups this year. In the U.S., our Meal Kits and Ch’eesy Mac are gaining national distribution through Whole Foods Markets. Our products are available in the United States, Canada, Australia, UK, Finland, Denmark, Sweden, Norway, Germany, Iceland, New Zealand, Ireland, Chile and Mexico. Currently, we’re working on getting the initial three Jackfruit flavors as much European placement as possible, and this month we’re debuting the Sweet & Smoky and Chili Lime Carnitas Jackfruit flavors, as well as the Massaman Curry and Pad See Ew Meal Kits at SIAL show in Paris. In early 2019, we’ll be selling a few of our seitan SKUs in Europe, starting with stores in the UK. We’ve seen a growing demand from conventional retailers over the last few years, so increasing our saturation in those markets, while also introducing innovative new lines to the tried-and-true natural chains, is a focus for us. As we grow and continue to expand internationally, the types of partnerships we’re looking for will include international distributors, brokers, marketing support, etc.